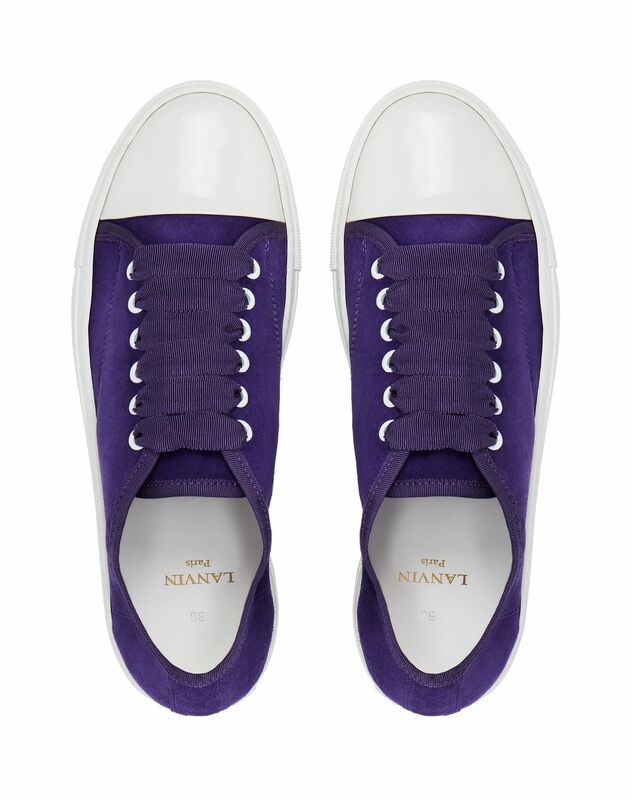 Low-top sneaker in dark purple suede goatskin leather, contrasting cap toe in white patent leather, tone-on-tone topstitching, dark purple grosgrain ribbon laces, silver-finish metal eyelets, calfskin leather lining with "Lanvin" logo and contrasting topstitched white rubber sole. This goatskin leather sneaker stands out for its grosgrain ribbon and exquisite dark purple color. The tone-on-tone topstitching details add a contemporary touch to this feminine, comfortable and elegant model. Main material: 100% capra goatskin leather. Secondary material: 100% calfskin leather. Lining: 100% calfskin leather. Sole: 100% rubber. Heel height: 1". Made in Portugal.